As every experienced law enforcement officer knows, police work is driven by quality intelligence: The more information you have, the more comprehensively and quickly you can solve a crime, prevent a security breach or respond to an emergency. Video is one way police collect critical data for law enforcement. By using surveillance cameras and video footage from multiple sources, they can use the information and apply Video Content Analytics (VCA) to quickly pinpoint relevant details, extract crucial data and support open cases with the mined information. Video data refers to the information drawn from video that can then be used for deterring crime, recording incidents and responding to threats. When VCA engines process video, they identify the video’s objects – people, vehicles, and other items that appear in the footage – and index them, so that they can be easily searched and analyzed. Whereas, traditionally, police work often demanded watching hours of video footage, monitoring one or multiple camera feeds in real-time and trying to stay focused and alert, Video Content Analytics help police quickly and efficiently locate vital evidence without the typical time and resource constraints – and fears of distraction and human error. Using Artificial Intelligence (AI) technology, video analytics trains computers to detect and extract data from video. Through exposure to multitudes of tagged images and videos, VCA engines learn to detect and distinguish between video objects; extract and identify them; analyze their behaviors and attributes; and classify the data for different applications – including law enforcement. How does video data help solve crimes and promote safety? Video evidence: Captured footage can be used as evidence to support cases and solve crimes. When video footage is processed by a video analytics engine, the raw data is structured into an index of the objects that appeared. So police can have a high-level view of what appears in the video or can filter through the video to find objects and people of interest. Police can get to the point fast, which enables them to close investigations, solve crimes and understand developing situations. Situational awareness: Video helps promote safety and prevent crime by enabling officers and monitors to track areas of interest and be alerted when objects or people enter them. With comprehensive video surveillance and analytics capabilities, police officers quickly can understand complex scenes and determine how to best respond when situations arise. Video analytics is also used for understanding human and vehicular traffic patterns, to help LEOs police and control the flow of people, cars, public transport vehicles, and even bicycles. Emergency response: Video analytics can be configured to recognize and trigger a call to action when unusual behavior is detected. It can even be used for something as basic as detecting when a vehicle is parked in a spot designated for emergency vehicles, so that someone can be deployed to move the vehicle and clear the space in case of an emergency. Quick access to information enables rapid and proactive response. 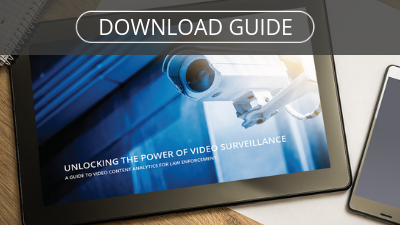 Video data continues to be a crucial tool for law enforcement, and, with Video Content Analytics, it is becoming an even more valuable and actionable asset. Want to learn more? Read a case study about how VCA revolutionized how the Hartford PD approaches drug busts, helping them pinpoint criminal hot spots and respond to illegal activities.